In a case of tragic events, rescue workers on Sunday pulled out mortal remains of a 14-month girl, who had accidentally slipped into an open borewell in Telangana's Ranga Reddy district on Thursday. After about 58 hours of rescue operation involving different agencies, the child, daughter of a farm labourer, was found dead, police said. The girl, fondly called as Chinnari, was playing with her elder sister when she accidentally fell in the nearly 450-feet-deep open borewell in a field at Ekkareddyguda village of Chevella mandal, about 60 kms from here, on Thursday around 7.15 pm. "She is declared dead...we called off the rescue operation at 6 am after the remains were retrieved," Cyberabad Police Commissioner Sandeep Shandilya told PTI. The authorities said on Saturday that chances of the toddler's survival were bleak. The efforts to rescue the child had started from 8 pm on Thursday using different methods. However, today her remains were found stuck at around 245 feet, police said. "After the postmortem was conducted, the child's remains were handed over to her family members and taken to her native Gorepally village," Chevella police station's sub-inspector N Sridhar Reddy said. After the girl fell into the borewell, a parallel trench was dug along the hole with the help of earth excavating machines even as the rocky area and rains hadhampered the rescue work. 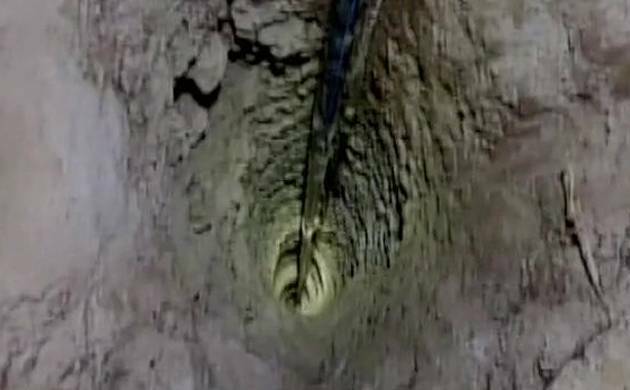 High-tech sensitive cameras were deployed to locate the girl and oxygen was continuously pumped in the borewell. Apart from police, the fire department, National Disaster Response Force (NDRF) personnel and a team of ONGC officials were also involved in the rescue operation. A team of doctors and ambulance was also deployed at the spot. The Cyberabad police yesterday registered a case against the land owner, Malla Reddy, under IPC section 336 (act endangering life or personal safety of others). In October 2014, a four-year-old girl died after falling into a nearly 300-feet-deep borewell in Ranga Reddy's Manchal village.